You save $4.00 on quantity of 6 bulbs over “each” price on this variety. Unscented. 3 to 4 Feet. June flowering. 'Night Flyer' has an out to slightly-pendant style and is a superb black-red in color. 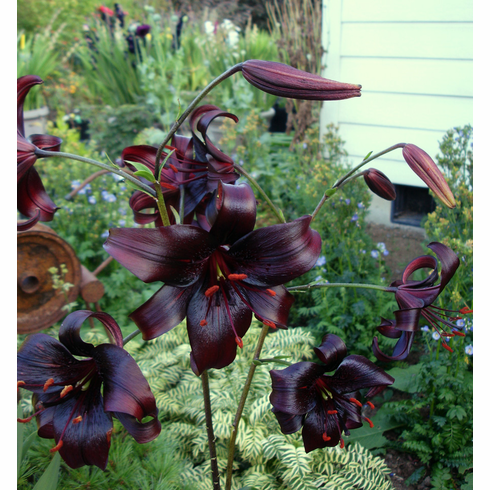 The flower is so dark that one doesn't immediately notice the spots because they blend so well into the overall color. The slightly curled flowers are heat resistant, lasting a long time in the garden, and have orange pollen for contrast. Established bulbs will often produce a dozen or more blooms. 3 to 4 Feet. June Flowering. Unscented.